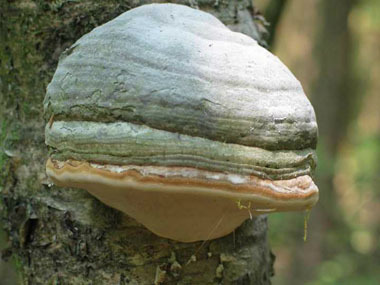 Overview: Fomes fomentarius occurs throughout much of the northern hemisphere and in some parts of the southern hemisphere with the ability to live up to thirty years under optimum conditions. It is geotropic meaning it grows down. Tinder hoof has been recognized throughout the centuries for medicinal uses. It is known as a means to boost immunity, enhance blood circulation, regulate blood sugar and lower blood pressure. 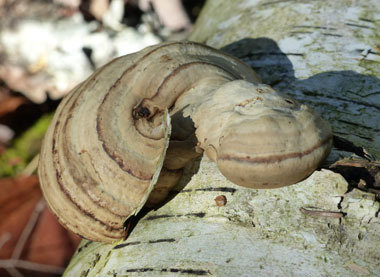 Distinguishing Features: Fomes fomentarius is a tough perennial that usually becomes hoof-shaped and darker with age. 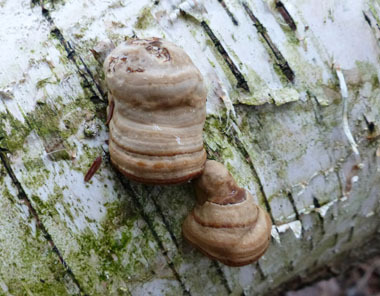 It is light grey or brown and grows 6 to 22 cm (2-8”) wide and has no stalk as the fungus thickens at the site of attachment to the wood. 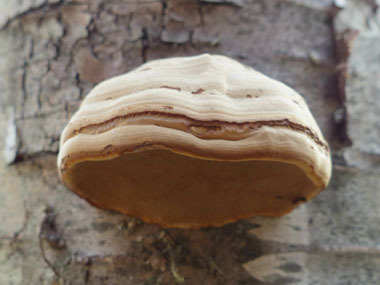 It is woody, has a tough surface, with broad, concentric ridges and a smooth underside that is light brown. Annual layers of tubes build up to produce the large hoof-shaped structure. Height: 7 to 25 cm (3 to 10”). 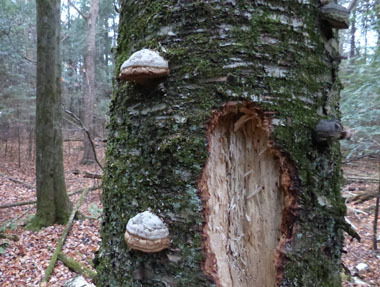 Habitat: Parasitic and saprobic on the wood of decaying hardwoods; this large bracket fungus attacks mainly birch trees but occasionally will grow on beech and sycamore. 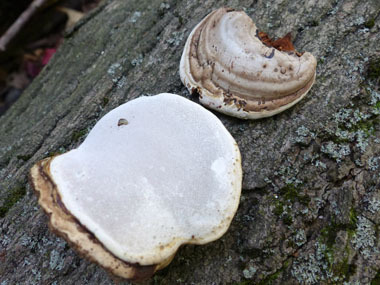 Spore print: White (sheds spores in late spring or summer). Edibility: It is far too hard to eat so you must break it up and make tea with the smaller pieces. You can also grind into a powder and add it to soups or coffee for added nutrients. For more in-depth information (e.g. nutrition, medicinal values, recipes, historical information, harvesting tips, etc.) please check out our Tinder Conk PDF magazine.